Dom Moraes once wrote a moving tribute to a relatively unknown poet, and countless others like him, aptly titled ‘Poet Whom No One Discovered’. 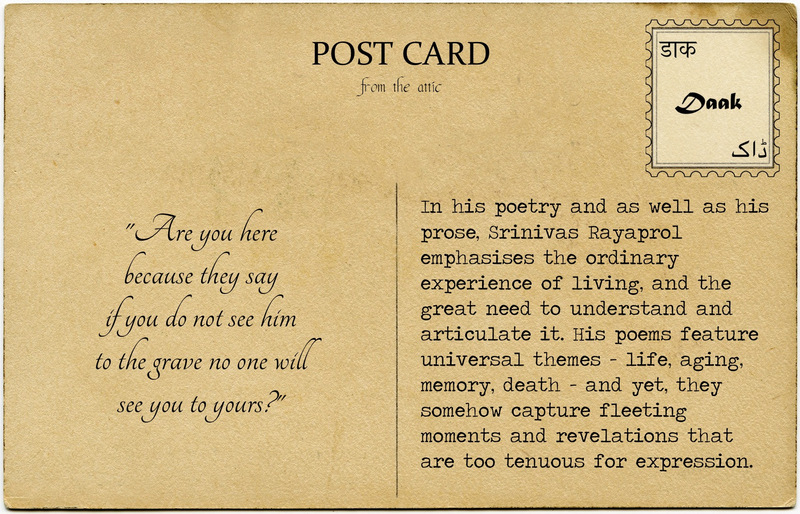 He was talking about the quiet, elegant and extraordinary poems on ordinary life by Srinivas Rayaprol. Born and raised in Secunderabad, Rayaprol followed a predictable yet conscientious path, first completing his graduation in India and then going to Stanford University to study Civil Engineering. While at Stanford, he started writing poetry and became acquainted with other writers and poets. Although Rayaprol joined government services and steadily rose to the top, he never quite abandoned his literary pursuits. His poems were featured in several national and international publications and he even founded, edited and funded a literary journal, ‘East and West,’ featuring prominent poets and writers from India and abroad. In his poetry and as well as his prose, Rayaprol emphasises the ordinary experience of living, and the great need to understand and articulate it. His poems feature universal themes – life, aging, memory, death – and yet, they somehow capture fleeting moments and revelations that are too tenuous for expression. Seclusion of the individual mind. You can download a free copy of his ‘Selected Poems’ here.